Campgrounds in the Smoky Mountains, There's One for Everyone! Campgrounds in the Smoky Mountains might seem a bit on the rustic side, but you definitely get your money's worth. Spending $15 or $20 a night isn't bad at all if you don't mind doing without some modern conveniences. So, what do I mean by rustic? Some of the things you won't find are showers, hot water, and electrical hook-ups. 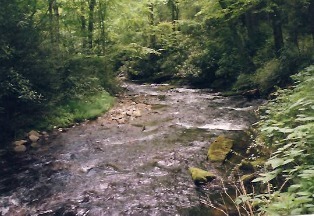 Great Smoky Mountains National Park operates 10 frontcountry campgrounds. You'll get the basic necessities: restrooms, cold running water, and flush toilets. Each site has a fire pit and picnic table. Cades Cove campground is convenient, but it can also get pretty crowded. Last time I was there, there were no mirrors in the bathrooms, but they did have automatic sinks and toilets. Even though Cosby campground is kind of out of the way, it's pretty quiet and it's big. We had a pleasant experience at Smokemont. It wasn't crowded and we hiked Smokemont Loop Trail. We walked to the trailhead from our campsite. This campground is popular since it's so close to the Gatlinburg entrance. I think of guitars strumming when I think of Elkmont:) We were able to get to sleep, thankfully! This is one of my favorite campgrounds in the Smokies. Cataloochee is a quiet peaceful valley with lots of historic sights to see. I haven't camped here yet, but I've heard it's great for families. There are easy waterfall hikes nearby and it's a popular place for tubing. This campground is off the beaten path as it's on the very western side of the park, right below Look Rock. I haven't stayed there, but I hear it's a great spot for trout fishing and if you want to steer clear of the crowds. I haven't camped here yet, but this one is definitely on my list. I've heard lots of great things about it. The high elevation makes for cool weather, it doesn't get crowded, and there are great hiking trails nearby. - located near the end of Heintooga Ridge Rd., take the Blue Ridge Parkway to get to Heintooga Ridge Rd. Like nearby Abrams Creek, Look Rock is off the beaten path. So, it's great if you want to find some solitude in the Smokies while you're camping. I haven't stayed here before, but I hear it rarely fills up.